This marker is a large stone and masonry arrowhead with a bas-relief Indian chief portrait. It was intended to represent “Chief Sequoia” (Sequoyah) of the Cherokee. The portrait shows an Indian wearing the feather headdress that would have been worn by plains Indians and not a Cherokee. Although sponsored by the Boone Trial Highway and Memorial Association no Daniel Boone tablet is present on this marker which was placed to mark old Indian trading paths. Like several others in the Boone Trail series this marker has a collection of arrow points held by mortar above the plaque. This Boone Highway marker was numbered 20A by Everett G. Marshall. His interest and research of the markers led to the book, Rich Man, Daniel Boone. The numbering system was simply the order in which he found or became aware of a marker. Speakers for the dedication were Dr. W.K. Boyd of Duke University and Mrs. Sydney Perry Cooper, State regent, Daughters of the American Revolution. 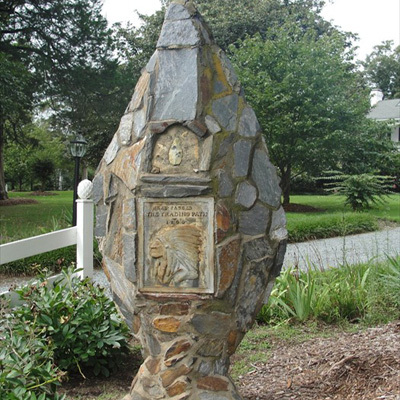 The marker is located at 106 Mason Road, Durham, NC on the grounds of the Arrowhead Inn Bed & Breakfast. The memorial marker stands in the Arrowhead Inn's gardens, surrounded by evergreen and seasonal plants and flowers.